The Mini Magic Makep Remover Cloth By W& Thats So Quick Easy To Use And Works With Only Water! Clean & Wash Your W7 Mini Make Up Remover Cloth Before Your First Use. Place Your Mini Magic Make up Remover Cloth Under Warm Running Water Unitl Is Saturated. Gently Wipe And Rub Off Your Make Up In Soft, Smooth Circular Motions Unitl Your Make Up Has Vanished. 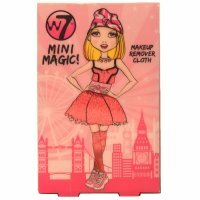 Clean & Wash Your W7 Mini Magic Make Up Remover Cloth For Next Time You Want To Remove Your Make Up.